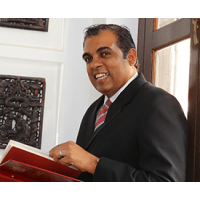 Mr Pratap Kishan – LL.B (Hons), University of London and Barrister-At-Law (Middle Temple), Advocates & Solicitor Singapore, Commissioner for Oaths and Notary Public. Pratap was called to the Utter Bar of the Honourable Society of Middle Temple in 1998 and subsequently called to the Singapore Bar in 1999. Pratap has been in active legal practice in Singapore since 1999 with various law firms before setting up his former law practice of Kishan LLC, which was dissolved when he merged with the present firm of HO WONG LAW PRACTICE LLC, where he is one of the Directors of the law corporation. Pratap’s scope of legal practice has been very wide and across various areas of law. His practice areas encompass all types of litigation matters ranging from civil and commercial disputes, criminal litigation to matrimonial matters and general solicitors’ work. Pratap has a vast experience in criminal litigation including as Lead Counsel for criminal trials in the High Court and Court of Appeal. In the area of civil litigation, he has also experience in trial and appellate matters. Pratap also handles arbitration matters. Pratap is a volunteer lawyer with the Jamiyah Legal Clinic rendering legal advice to needy members of society. Pratap is also a volunteer lawyer with the Singapore Anti-Narcotics Association (SANA). Pratap also volunteers with the Criminal Legal Aid Scheme with the Pro Bono Office of the Law Society of Singapore for the lesser privileged members of society for criminal cases and on the Assigned Defence Counsel (Lead Counsel) list for capital (death penalty) cases in the High Court.